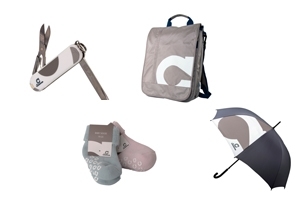 The insurance company Continentale‘s collection of promotional products is grey in grey, and yet extremely colourful, diversified and contemporary. The series that was created by the two Dortmund-based agencies, Dicke & Partner and DWD, focuses on the new spot colours of the company – warm grey in two shades – and form the related design elements of the series. The basic design created by the DWD designer Oliver Rentzsch can be applied to almost every item of the collection by varying the cut and the position of the logo, which facilitated the design and approval of the items. Furthermore, in terms of a reasonable pricing as far as possible sustainable products made of environmentally-friendly and fair trade raw materials were implemented. The jury of the Promotional Gift Award 2018 were all in agreement that the collection of promotional products excelled because of the consistent implementation of the aesthetic, newly developed basic design and promptly distinguished the series with the Promotional Products Collection Special Award. According to the jury the special high recognition value is the spot colour, warm grey, which was applied in rarely similar colour surfaces that were however of uniform appearance and present the insurance company in a striking manner.